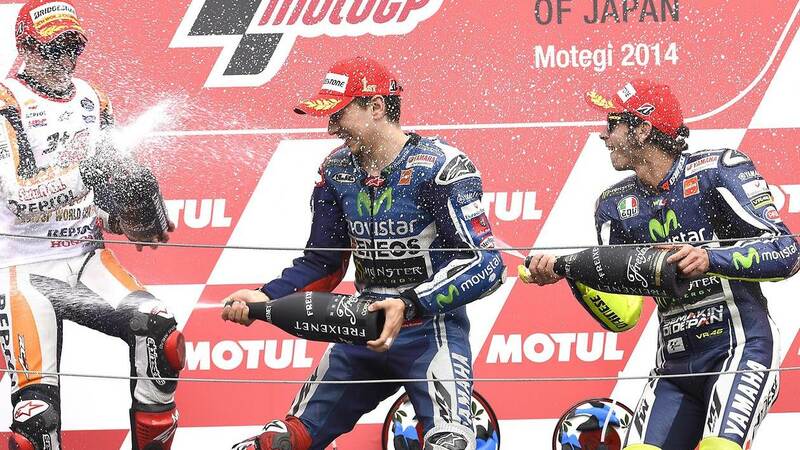 Yamaha MotoGP’s Jorge Lorenzo continued his irresistible form in the second half of the 2014 MotoGP season as he won his second consecutive race at Motegi as Repsol Honda’s Marc Marquez made it back-to-back MotoGP World Championship titles by taking second place in the Japanese Grand Prix. An exciting start to race saw Movistar Yamaha MotoGP’s Valentino Rossi get the holeshot to lead into turn one, a position he held for the first four laps before Lorenzo squeezed past his teammate to take the over at the front. As his rivals battled behind him, Lorenzo set a scorching pace at the front of the field, setting a new Motegi race lap record of 1’45.350 on lap eight and going on to take the chequered flag by 1.638 seconds from Marquez, with Rossi rounding out the podium in third place a further second back. Race day at Motegi experienced the coolest conditions of the weekend with the peak track temperature recording during the race being 27°C which was 13°C cooler than measured during qualifying yesterday. The fresher temperatures didn’t have a significant effect on race tyre choice, with almost every rider opting for the same tyre combinations they used in race simulations earlier on the weekend. All twenty-four riders selected the medium compound front slick, while fifteen riders selected the soft compound rear slick, and the other nine riders opting for the extra-soft compound rear. After record-breaking pace in yesterday’s qualifying sessions, more records were set at the Motegi circuit during the race with race winner Lorenzo setting a new race lap record of 1’45.350 on lap eight and the overall race time today being over ten seconds quicker than the existing record. With Marc Marquez wrapping up the title at Motegi, the focus now shifts to the battle for second place in the riders’ standings. Valentino Rossi and Dani Pedrosa are currently tied on 230 points, while Jorge Lorenzo is now just three points behind on 227 points and fourth in the standings. “Given the pace we showed during practice, today our target was to fight for the seventh position: unfortunately, I was not able to do more than that. As always, I couldn’t ‘feel’ the rear tyre and I struggled to stop the bike under braking, so it was difficult to ride. Hernandez passed me at the start and then I was stuck behind him many laps because I couldn’t overtake it: I couldn’t brake hard, while he was able to brake deep into the corner. When I finally passed him, it was too late to reach the riders in front of me, so I closed the race in tenth position. If these problems will continue it will be very hard to do better results, so we hope to find a solution for the next races”. “Today I struggled to follow the right line under braking: I went deep several times and I also went off the track on the grass two times, losing a lot of time. It was difficult today to be consistent. We still don’t know why we had this problem: we will check alla the data in order to fix ita head of the upcoming races. In addition, in the last 5 laps the front was pushing a lot, because I used a lot the front tyre at the beginning of the race. I’m not satisfied with the result”.